Google Maps Navigation feature is originally available only for Google Android OS 2.0 Eclair on the Motorola Droid, with features such as easy easy, voice commands, traffic reports, car dock mode, satellite view and street view close up picture support. Google Maps Navigation has now also been made available for mobile cell phone devices running Android 1.6 or higher. However, the initial release of Google Maps Navigation is limited to the United States. So international Android users outside US cannot uses the free Google Maps Navigation for turn-by-turn GPS direction navigation service on their mobile phone yet. 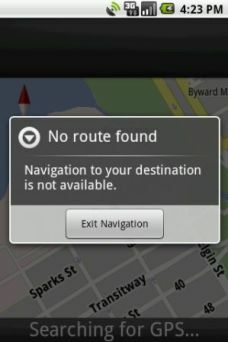 When users attempt to plot and navigate a route between two locations with either one location is a non-US location with GPS navigation, the following error message will be displayed, with Exit Navigation the only option available. Navigation to your destination is not available. For users who want to use the free navigation service on the Android-based phone, there is a hack available to modify Google Maps so that the direction navigation feature works outside USA. The hack was developed by Brut.all from xda-developers.com. The latest hack is revised after Google blocks a previous crack, which would make full navigation functionality works out of US boundary. The new hack uses a modified or tampered version of Google Maps that restores the navigation feature. The modified Google Maps runs on version 3.3.1, and works at anywhere where Google Maps has the “Directions” feature, but after installing the hacked version, the Google Maps has reduced functionality, including in the USA. No street name at the top. No arrow indicating next turn direction. Voice guidance is delayed, if there is any voice guidance at all. Thus, it’s recommended that Android users in US and those who need only navigation features for US locations to stick with the official version of Google Maps, downloadable from Android Market. For non-US Android users who want the turn-by-turn navigation feature of Google Maps for Mobile, canadiancow has made a simple launcher app called Nav Launcher that will install the modified version of Google Maps automatically. Nav Launcher also lets user easily navigate to a contact or any other destination by typing or speaking the name or address. To install “Nav Launcher”, uninstall Google Maps, and then search Android Market for “Nav Launcher”, or click on the link here on Android device. If you have root, uninstall the current Maps app with one of the following options. Regardless of whether user has root, install the SpeechSynthesis Data, either by going into the market and searching for SpeechSynthesis Data Installer, or go to Menu -> Settings -> Speech synthesis -> Install voice data (available on some ROMs such as CM 4.2.7.1). For user with root, download http://ul.to/dh1cbe/maps3.3.1-brut-root-3.apk.